Rain Reign is the story of Rose Howard. Rose is a young girl with Asperger’s Syndrome who loves homonyms, finds comfort in prime numbers, and has the sweetest dog, Rain (Reign). Told in the narrative voice of Rose, this story allows us to see Rose’s life at home and at school; both offering up challenges for Rose. At school, Rose has been held back due to her Asperger’s Syndrome. Her prime number outbursts, beating herself in the head, and having a personal aide cause her to not always be well received by her peers. Making conversation and interacting appropriately is challenging and we get to see Rose working through these interactions and gaining understanding of why the simplest things are so hard. At home, Rose lives with her father. Rose’s mother left when Rose was young and all she has left is all her mother’s memories of Rose stored in a faded box. With a father who sporadically works but consistently drinks, home is an unsure place for Rose. Rose’s father is clearly frustrated with her constant questions, disruptions at school, and obsessions with homonyms. There are two bright spots in Rose’s life: her dog Rain (Reign) and her Uncle Wes. Rain is always there waiting when Rose comes home and offers comfort and security. Together, Rose and Rain, are able to handle the moodiness of Rose’s father. Uncle Wes is a treasure for Rose. He understands how she thinks and they even have a secret hand signal that they use. Uncle Wes is an anchor for Rose when life gets crazy. And when a hurricane comes through town and Rain is lost, life is turned upside down and Rose is faced with a very difficult decision. Using her gift for order and routine, Rose is able to locate Rain when all hope seems lost. Then in a beautiful and amazing act of bravery and love, Rose makes a great sacrifice. 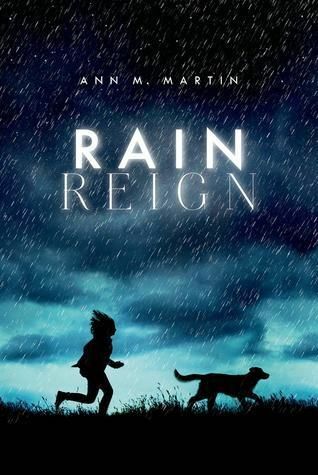 On a whim, I grabbed Rain Reign to read. Within the first chapter I was intrigued to see where this story was going to take me. I never imagined that it would be so moving, so compelling. At times I found myself reading with a little smile on my face and other times I was wiping tears from my cheek. I think the power of this story comes from it being told in the narrative voice. Seeing Rose’s progression through the story, seeing her heart, her thoughts is so very powerful. I went into reading this story thinking it was a book about a girl who was autistic. How shallow of me. This was a beautiful story of friendship, love, and sacrifice. The story being told in the voice of a girl with Asperger’s Syndrome adds another layer. A layer that will perhaps help us to be more understanding, more patient, more kind to those around us. As soon as I finished Rain Reign, I handed it off to my twelve year old daughter. She hasn’t finished the book yet but we are already having discussions about different characters and their choices. In hindsight, I would make this a read aloud so we could all share it together. I am so glad that I didn’t overlook this simply told story of a girl and her dog. This entry was posted in Book Reviews, Books, Read alouds and tagged Books, literature, reading, review by sweetie. Bookmark the permalink.